In food styling and food photography, you can choose between different camera file formats, including RAW, JPEG, and TIFF. The RAW camera file format is just what it sounds like: It’s raw, barely processed image information. You can select the option to shoot RAW (or other file formats) in your camera’s menu, as you can see in the following figure. When you upload a RAW file to your computer and double-click it, the RAW converter dialog window opens. This option-filled dialog allows tweaking of all the various image adjustments for a photo, such as color balance and saturation. 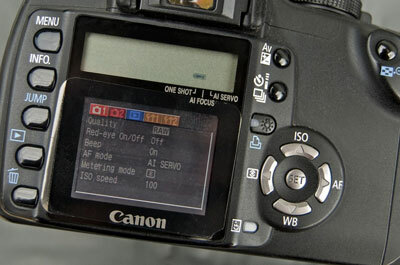 Choosing the RAW file format in your camera’s menu. Why should you shoot RAW files when photographing food? Well, first off, RAW files produce a much higher quality starting point for your photos. And when you handle image adjustments within the RAW dialog, they’re cleaner and more accurate than if you tweaked them after the fact as JPEGs in a photo-editing program. Although RAW files produce a larger file size, most professional photographers absolutely swear by shooting RAW for greater quality and control. JPEG is a lossy format, meaning it loses some image information along the way, particularly during repeated saves of a file. So although you may need to submit JPEGs to your clients or stock agency, you’ll likely want to start by shooting RAW for the best quality. From there, edit the RAW file in the RAW converter dialog, and then save the file as a JPEG via your photo editor. Some stock photo agencies or clients require high-quality TIFF files rather than JPEGs. TIFF is generally lossless, meaning it doesn’t lose image information when saving the image as an uncompressed file. So the procedure for using TIFF files is to shoot RAW, upload the file, edit by using the RAW converter dialog, and save the image as a TIFF file. TIFF files can be rather enormous in size, so be aware that you may need some extra hard drive space on your computer.